In 2007, Sharon Jones and the Dap-Kings nabbed it in a hard fought battle. Last year, Raphael Saadiq easily triumphed. And now, ladies and germs, I'm pleased to announce that this year's award for album that sounds most like '60s-era Smokey Robinson goes to a relatively unlikely source: one Mayer Hawthorne, a suburban Michigan DJ whose debut release, A Strange Arrangement, so closely resembles Robinson's early work that it could be easily mistaken for a lost Miracles recording. Ever since modern technology made it possible to reproduce the sound of not-so-modern technology, a new generation of artists has been working around the clock to create albums that have already been created. Thus, we have A Strange Arrangement. Reportedly produced as a joke by Hawthorne -- though few would believe anyone would devote this much time and energy in jest -- the album was picked up by California experimental hip-hop label Stones Throw after the label's chief, rapper/producer Peanut Butter Wolf, heard only a snippet of Hawthorne's demo. 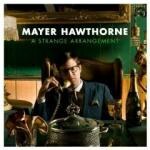 According to the Stones Throw website, Hawthorne, the pseudonym for one Andrew Mayer Cohen, has few of the background experiences that most legendary soul singers seem to have. He never sang in the church choir; he didn't play in his high school jazz band; he never performed as the lead singer in a high school rock 'n' roll band; and he has no formal musical training. In fact, the only thing -- and perhaps the most important thing -- he has in common with the Curtis Mayfields, Otis Reddings, and Smokey Robinsons of the world is a deep and abounding love for rhythm and blues music. That love comes across like a sharp thwack to the noggin on A Strange Arrangement, with its falsetto vocals, doo-wop background singing, percolating horns, and hook-laden blues riffs. It's true that Hawthorne doesn't have Robinson's voice, Pickett's presence, or Redding's stellar studio band -- Hawthorne reportedly played or programmed all the instruments on A Strange Arrangement himself. But Hawthorne has nailed the cool soulfulness of the early Miracles efforts with a bubblegum sticky collection of radio-friendly, R&B-stained pop. And while some of the quantized drum beats, too-clean transitions, and perfect harmonies hint at the gigabytes at work behind the music, A Strange Arrangement is nonetheless a thoughtful, clever, and enjoyable tribute to an era in music thought to be long gone. A Strange Arrangement, with its smoky retro aesthetic, is best viewed as a whole rather than a collection of individual songs. Listening to each track, you have the distinct feeling that you've heard it somewhere else, possibly long ago. None of these songs stands out, and each track's purpose seems to be to contribute to the overall creation of a work that totally evokes '60s-era R&B. That being said, there are some great, hooky songs with nice arrangements here. The album-opening "Prelude" is pure barbershop doo-wop, recalling the Temptations, the Four Tops, and even the Beach Boys. "Just Ain't Gonna Work Out" begins with that gentle, familiar Isaac Hayes-esque spoken word: "You know baby / I know you think we can make it all work out / But I gotta tell it like it is / I don't wanna make this any harder than it needs to be / So don't cry". "The Ills" adds hot horn riffs to the mix, bringing to mind the sound of the JBs or the Bar-Kays. It's an odd coincidence that A Strange Arrangement, an album devoted to recreating Robinson's early work, should be released within months of Robinson's own return to form. With Time Flies When You're Having Fun, the 69-year-old R&B god has made an album semi-evocative of his Motown roots after an extended foray into contemporary soul/jazz. The true irony here is that, comparing the two releases, Hawthorne seems to have nailed the classic Robinson sound better than Robinson himself. If anything, A Strange Arrangement will hopefully turn a new generation onto a truly remarkable time in music.